Wes Anderson was, for me, a film-maker like Tim Burton. A man with a distinct and beautiful visual style but whose tendency to rework the same themes, with the same actors, playing essentially the same characters, had begun to pall. I particularly hated his last live action film, THE DARJEELING LIMITED, for its self-absorption, narcissism, rather exploitative attitude toward its Indian context, and ultimately for just being dull. With this in mind, I went into MOONRISE KINGDOM with barely any hope that I would find the kind of film - at once whimsical and yet also profound (echoes of Tarsem Singh's THE FALL!) - that I had fallen in love with while watching THE ROYAL TENENBAUMS. Well, my fears were groundless. MOONRISE KINGDOM is a simply wonderful film. It is, of course, beautifully designed, rich in background detail, empathetically scored, and well-acted. It affects a sweet yet knowing innocence - it's full of characters struggling to deal honestly with themselves and their loved ones - it deals with the darkest of emotions but it drips with hope - in friendship, in people doing the right thing - in family. It's as if everything that began to feel so clichéd about Wes Anderson has finally been re-united with sincere emotion - and that this emotional authenticity has cut through the stagey-ness of the costumes, locations, soundtrack - and transformed a whimsical confection into something altogether more lasting, provocative and memorable. It's as if Wes Anderson finally gave in and just told the story he always wanted to tell - about first love. Suzy B (Kara Hayward) falls in love with an eagle-scout called Sam (Jared Gilman) one golden summer in 1965. The carefully hatched plan to leave together triggers a sequence of scrapes, jams, shenanigans, emotional revelations and deeds good and ill.
Anderson perfectly captures that intensity of feeling when you're a kid and you feel nobody understands you apart from this one perfect person. Suzy's trying to escape her family - her kid brothers, her distant father (Bill Murray) and the mother (Frances McDormand) she suspects of sleeping with local policeman (Bruce Willis). Sam's an orphan and a misfit with a good heart. In one of the most affecting scenes, written in exact mimicry of how we speak at that age, Sam tells Suzy he loves her but she's talking nonsense for hating her parents. Suzy and Sam run away together. They're at the age and living in the time when you're hold world fits into a suitcase, and you take your're favourite adventure stories rather than clothes. When you can place you're entire life into the hands of another person without second-guessing yourself. There's a deep vein of melancholy running through the film. Most of the adults seem desperately lonely, none moreso than Ed Norton's majestically decent scout leader. The exception is the almost mechanical Social Services, played by Tilda Swinton with steely efficiency. But the kids are in their own world, where all things are possible, and where adults barely skim the surface, except as occasional constraints and only too rarely as facilitators. There's excitement and wonder and threat and crushing disappointment. As the movie builds to a pivotal final scene (superbly scored to Britten's Noye's Fludde) I realised that I deeply cared about these kids. I wanted desperately to know what they happened to them, and not just to download the soundtrack they were listening to. It's been a long time, but we finally have a Wes Anderson movie that makes us feel as well as admire its surfaces. 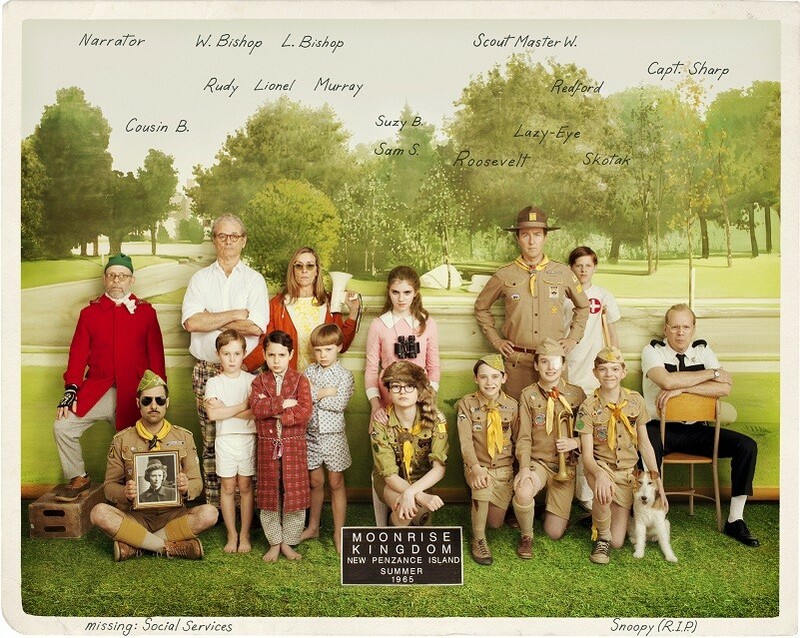 MOONRISE KINGDOM opened Cannes 2012. It is on release in France, Germany, Ireland, Turkey, the UK and he USA. It opens next weekend in Belgium, Iceland, Hungary and the Netherlands. It opens on June 6th in Sweden, on June 8th in Norway, on June 15th in Greece and Spain, on June 21st in Russia, on June 2nd in Portugal and Lithuania, on August 16th in Slovenia and Argentina and on August 30th in New Zealand. DARK SHADOWS - Enough already.